Incorporating the stringent requirements for medical device sterilization systems into propylene oxide pasteurizers, our technology meets the regulatory requirements and expectations of the U.S. FDA for process control and validation. Scrutiny on agricultural products, including spices and nuts, for pathogen contamination is increasing. Federal import detentions and the Reportable Food Registry place commodity importers and their customers on the front pages of newspapers and on the nightly news. 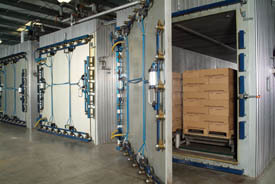 Our propylene oxide pasteurizers exceed the requirements of the Almond Board of California’s protocol for almond pasteurization ensuring that your company’s commodities achieve a 5-log or greater reduction in pathogen contamination.